Kanye West and Kid Cudi’s Kids See Ghosts is very much a performance of depression. Each rapper has spent time publicly dealing with a mental health crisis within the same time period, with Cudi checking himself into rehab after an online tirade (including at Kanye) for “suicidal thoughts,” and Kanye being checked into a hospital after a “nervous breakdown,” following a series of rants during his “Saint Pablo” tour (some of which were aimed back at Cudi). The aftermath of this experience is fully evident in Kids See Ghosts, a collaboration that alternates from alienation and sadness to melodic tenderness, punkish rap bravado, and triumph in 23 minutes. It’s both embarrassing and gripping: never boring and often euphoric. Kids See Ghosts’ most impressive feat might be how it gets use out of Kid Cudi’s skill as a musician. An artist with a weakness for self-indulgence, he’s in love with the idea of his music showing off his eclectic taste, when instead it often just shows a lack of creativity. When Cudi is left to his own devices you get the rock album WZRD, or the attempt at serious genre experimentation Speeding Bullet To Heaven. These are albums that have their defenders but teeter between boring and excruciating, not because they’re too weird but because they’re not weird enough. Cudi does most of his best work with Kanye because Kanye knows how to utilize him effectively—in moderation, strategically using his ear for melody and his ability to convey soft vulnerability. Yet Kanye and his team pull off a neat trick with Kids See Ghosts, taking Cudi’s musical strengths and centering the album around them. It makes for a perfect version of a Kid Cudi album, with Cudi taking center stage under the guiding hand of Kanye’s stellar production. This is Kanye’s second album this month of course, and third if you count his production on Pusha T’s Daytona. Kanye’s solo album ye is a lot of things, but most striking of all is how unfinished and unremarkable it feels. Kanye has said himself that he re-did the whole thing after an awful interview with TMZ, and it shows in how hurried and reactionary the music is. But in Kids See Ghosts what we get is an album that gives the impression that it has actually been thought out, full of labored-over flourishes and reflective lyrics. For all we know, Kids See Ghosts could’ve been just as hastily made as ye, but if so the seams don’t show. The music is industrial and hard-edged until it’s suddenly dulcet and sweeping, matching the fury and then tenderness with which Kanye and Cudi perform throughout. The shift in tone doesn’t feel jarring, but instead like it was building up to that the entire time, a testament to how dynamic and complex Kanye’s production can still be. It creates an anthemic, orchestral experience that is just as, if not more, important than the words sung or rapped. If Kids See Ghosts has a theme, though, it is in that performance of depression and recovery. The album centers on the what brought Kanye and Cudi to that place, as well as their claims that they have emerged better and stronger even as they still deal with their problems. On “Reborn,” both men revisit these issues in differing lights. Kanye raps, “I was, off the chain, I was often drained / I was off the meds, I was called insane / What a awesome thing, engulfed in shame / I want all the rain, I want all the pain.” Later, Cudi raps on the song, “I had my issues, ain’t that much I could do / But, peace is something that starts with me, with me / At times, wonder my purpose / Easy then to feel worthless.” Both men acknowledge their trouble but ultimately towards opposite ends, with Cudi searching for peace and Kanye wanting to be ok with chaos. It’s not an issue of right or wrong but a difference in how to move forward. That said it isn’t always easy to buy into their introspection. A song like “Freeee (Ghost Town pt 2)” sounds nice and is fun to sing along to, but your eyes will glaze over if you interrogate what they’re saying. It’s especially difficult to take from Kanye, who has spent the time from album announcement to release proving his status as a “free thinker” by defending his love for Trump and becoming indoctrinated by alt right luminaries, such as Candace Owens and Charlie Kirk. Kanye’s version feeling free doesn’t sound appealing or actually true. You do buy however, that they want to believe in their own freedom from the world and maybe that should be enough. Rap music, with its lack of filter and confessional nature, has always been a vehicle by which men who uphold a veneer of toughness and masculine bravado can share their feelings and be vulnerable. Part of Kid Cudi’s appeal to fans was that it made this implicit knowledge explicit, which was fine and necessary for many; but his elevation to cult star specifically because of this is one of those things that contributes to a dismissal of much of the genre’s history with depression. It’s true that depression has been a touchy, misunderstood subject in poor, underserved communities, but it’s also always existed there. There’s no doubting the passion people have for Kid Cudi, as well as Kanye West, and the beauty of music is that it can be there for people when nothing else is. But a suspicion arises in considering how we decide who’s depression is taken seriously and, in the case of Kanye West, whether that justifies bad behavior. Is Cudi’s sadness more serious because it’s obvious to us? It is what’s going on in the margins and background of Kids See Ghosts that offer a more compelling insight than it’s messages. 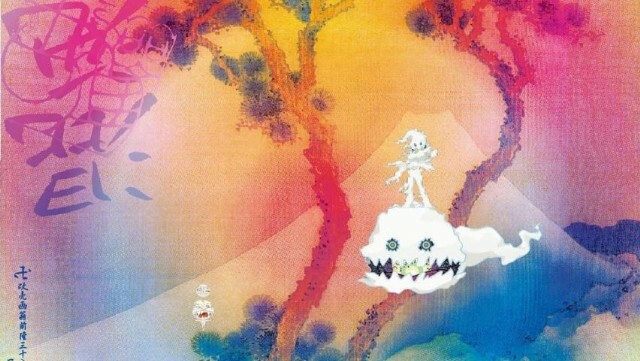 Make no mistake: Kids See Ghosts is a fantastic record, often when it’s not trying to say anything at all. What makes the album work as brilliantly as it does are things like Kanye’s ridiculous sound effects on “Feel The Love,” Cudi’s trademarks hums and deep tenor hymnals scattered throughout, the guitar samples (including one from Kurt Cobain’s “Burn the Rain”) and the melancholy finale, “Cudi’s Montage,” featuring both artists singing with quavering vulnerability. Kids See Ghosts is at its best at its most naked, with the two rappers leaning on their natural musicality. None of the explicit desires or Kanye’s scapegoating for his bad behavior do anything to make the album better or worse, instead it’s all just there, getting in the way of two musicians who are good at letting music speak for their feelings instead.